Again, I want to thank you so much for all the work you do on this website. Whenever I get "homesick" for Manchester, I simply visit and surf. I'm not exactly sure it makes me feel better though - sometimes, just makes me miss it more!! I would like to comment on the re-development of Piccadilly. I think it's a crying shame that the beautiful gardens (at least that's how I remember them!) are being replaced by concrete. When I think about England I remember greenery and nature. The last thing Manchester, or any city for that matter, needs, is more concrete. Shame on those councillors. But thankyou for preserving those memories on film for all of us who can't be there ourselves. Gorton and including a write up about it. I hear Spurley Hey High School is in danger of being closed. I went there as well as Gorton Mount Primary. I would love photos to show my children. Cross Street was a shopping outing when I was little, along with a 99 ice cream cone at Sivori's or a toasted tea cake at Marcia's cafe on Cross Street. All good memories. Thanks again. You make my day! In defence of the council, I should stress that in the new Piccadilly, there will be plenty of green areas - in fact, they've filled in the sunken gardens and knocked down the small house and walls at the Lewis's end to create a large, uncluttered open space, which I expect will be as well-used as the old gardens were. This gain in space is however offset by the construction of an office block at the Portland Street end - indicated by the red area on the plan, left. The land was sold off to raise money to pay for the makeover on the remaining part of the gardens. The scale and outline of the building remind me very much of the power hall of a power station. The construction of this office block could well turn out to be the planning disaster of the decade. I have two memories of Piccadilly. One is of coming from Lewiss' with my Mum, laden with shopping, to catch a bus. I must have been in my early 20s, I guess, and was home on a visit playing the dutiful son. We passed a tramp on a bench. My mum said "That man's hungry. I can tell by the way he's holding his stomach.". I said he'd probably just had a bad pint, but she said "No, I can tell hunger-pains". She said she couldn't just go past and see someobody like that. I used to fancy myself the big rebel, and think my Mum old-fashioned and conventional, but there was me embarassed, .saying "there's all these people . . .", and my little old-fashioned Mum, all dressed-up for Town (which was not just like popping down the corner-shop) said "I don't give a bugger! ", and told me to open the shopping bag. We had some sliced bread, and cheese. She went over to ask the tramp "Would you like a bit of bread and cheese, luv? ", and when he said yes, she proceeeded to make him up a cheese sandwich. I did reflect that a lot of the people in the gardens would be feeding pigeons, which only shat on the pavement, so what was wrong with feeding a human being? Anyway that day I learnt a couple of lessons. One was my Mum saying she could tell hunger-pains. Her generation had been through hard times, and I guess she knew more than she talked about, more than I did from reading books. The other was that my posing as the big rebel didn't seem so impressive compared with her simple practical action. And she was just an ordinary Salford mam, none of your big society ladies getting their name in the papers for showing off at charity dinners. Now, back to Piccadilly gardens. It had a raffish reputation in those days, being resorted to by prostitutes and their clients, I believe, but that was night-time. During the day it was a vital amenity for workers in town shops and offices, when the weather was good, to get a breath of fresh air and sunshine, relax and take their lunch amid the flowers. I can't imagine it has entirely lost that function. Surely the council cannot be intending to take that away? And surely the people who work in town or take a break in the gardens between shops will not allow the council to take it away? 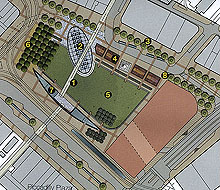 Again, I have to stress that in the new gardens, there will be plenty of green, empty open space. Look again at the picture, the only one released by the council. Few people in Manchester have any idea of what is happening in Piccadilly and the council should have provided more visualisations of the finished project. 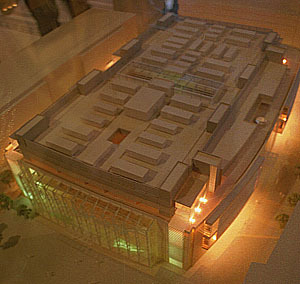 Is it now a done deal that there will be some kind of a building in what is presently Piccadilly? I hope not. All world class cities--and it would appear that Manchester city council is committed to making Manchester precisely that, a world class city--need an expansive green and open space at their heart. To destroy, therefore, what is obviously the prime candidate for this role in Manchester's case seems not only foolish but criminally shortsighted. 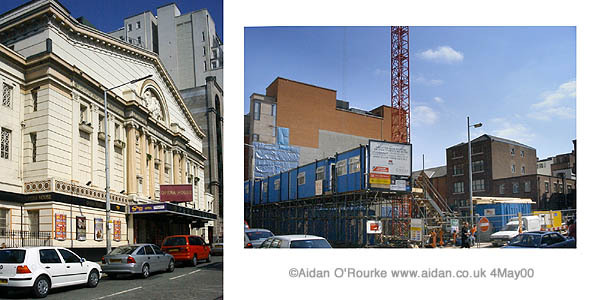 As you rightfully suggest, the goal should be to restore to their very best condition the present marvellous architectural assets Piccadilly already possesses, like all of those wonderful facades along the Oldham Street side, without ruining the present sight lines. The fact is, as you also note, the council has, to its shame, allowed this key area to go to rack and ruin for too many years, failing woefully in their duty to the city's residents in the process. 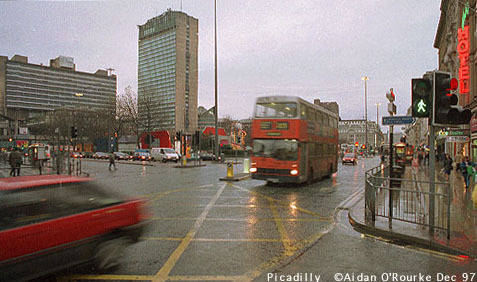 Now they propose to ruin Piccadilly for good and all. An open space like Piccadilly should be exploited in the way similar open spaces are exploited in other great cities. It constitutes the ideal location for the display of genuinely unique and imaginitive sculpture, for instance (not, heaven forbid, ugly clock towers and tired concrete cotton flowers done on the cheap). The gardens do, however, deserve a better centre-piece than the present rather limp and undistinguished fountain. To this degree, I would disagree with your observation about some type of a fountain being out of place in rainy Manchester. There are equally damp Northern European cities with impressive centrally located fountains, fountains that serve as perfect focal points for large squares and gardens. two, such examples of urban art would draw visitors, and these visitors would then go home and tell their friends about the beautiful things they saw while in the city. The power of the photo opportunity cannot be underestimated in the selling of a city to visitors from elsewhere, and--if my experience is anything to go by--sculptures, fountains etc. prove to be the de rigeur stand-bys when tourists reach for their cameras. What, in present day Piccadilly, would cause a visitor to linger, let alone take a picture (unless they have a trained eye like yourself)? Yes, the decision to go ahead with the office block has been taken and building will commence shortly. The new gardens will have walk-through fountains. There will be no new sculptures, though the existing statues, apart from Queen Victoria, will be moved around to new locations. A fountain was added to a main square in Leipzig in an equally controversial redesign and yes, it is very photogenic. Thanks for your thoughtful and very well-written contribution. Name: jean wood. nee cully. From or connections with: Salford, Trafford Road. Present Location: Adelaide . South Australia. Dear Aidan I am a 64 year old. Just learning the computer...So please excuse me if I do not comply with all the rules.. However Have enjoyed your web site. which came to me via my freind who now lives in Scotland... They keep me in touch with my birth place. I use to work in Manchester in the 50s I worked for Brian Mills .. My friend Barbara and I use to go to Lewis's for our lunch... They were very happy days..I Also worked for Alexander Kenyons in Chapel Street... Have no idea if they are still there..
My Grandparents used to live near Garside St... Where the Childrens hospital used to be.. I will be HOME again in August to attend a wedding of my niece.. I will be vistiing Manchester for the day and vistit Marks and Spencers. Which I miss very much over here. Hope this E mail reaches you.. Keep up the lovely work.. Who knows once I have finished my course on the computer I will be able to join you....Regards Jean Wood. Very glad to hear from you, and yes, your e-mail did arrive! Marks & Spencers is about to share its new city centre store with Selfridges. Hope you'll be a little better prepared for the new city centre after viewing my photographs! "County of Yorkshire West Riding"
This site continues to delight and inform me. I must raise a point with you, however, regarding your comments in reply to two correspondents. You rightly agree with the criticism of the defacing of the old county boundary markers in the Saddleworth area but use a derogatory term, i.e. "half baked" when describing the new counties put in place by the 1974 Local Government reorganisation. In commenting on another letter you criticise the Manchester City film office for not being able to help producers wanting to find facilities outside the City and comment on the need for one authority for the whole area - presumably in the context of film production assistance. Greater Manchester Council provided just such help from 1974 until it was wantonly handbagged by Thatcher in 1986. Its Arts Development Officer and staff, part of the PR Department, gave valuable assistance to all types of artistic endeavour from Wigan to Saddleworth and Ringway to Ramsbottom. The county also took over SELNEC, added Wigan Corporation Transport and offered a cohesive transport system which was dismembered by the Tories in the name of "liberalisation" (a euphemism for chaotic shambles) from which the area is only now starting to recover. The County undertook a number of impressive ventures in the fields of Country Parks, Tourism, Conferences, Lotteries and a host of other areas. I can honestly say that I enjoyed every day of the six years or so I was employed by GMC as the challenges we met and the results of our initiatives made me proud to head a department in County Hall. Of course, too many people could not understand how they had become Greater Mancunians overnight. They could not stomach the loss of their Cheshire status, or Lancashire heritage and the Royal Mail didn't help the County's identity by refusing to acknowledge the County as a postal address, using the same archaic thinking that preserves Middlesex as a postal address instead of the actuality of Greater London. A leading Metropolitan area like Greater Manchester needs a cohesive structure. The current system of (almost competing) Metropolitan Boroughs is a nonsense. London now has its Mayor and a degree of unitary control, Greater Manchester deserves the same. Only then will film producers and the myriad other potential bringers of work, income and prestige have a central point to which they can address their enquiries and from which they can receive advice covering the whole region. I agree that the Manchester area needs a single overriding authority, but I'd say: incorporate and acknowledge the ancient county boundaries and leave use of county on addresses to personal choice - the postcode is now the most important part of the address. I wonder how the residents of Kerry would react if their county was abolished and merged with County Cork? As for my comment 'half baked' this was perhaps a bad choice of words. The new local government system of 1974 was two tier and 'full baked'. What we see today is half baked because one half - the upper tier - of the local government equation was removed by the Conservative government in 1986. The individual local authorities then took over nearly all functions of local government - not what was originally intended. 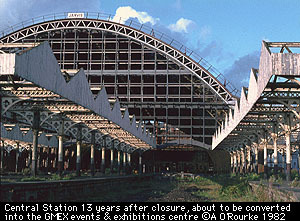 The Greater Manchester County Council did a good job, and one of its last and greatest achievements was the conversion of the derelict Central Station into GMEX. In your section about Eccles Pike you asked why it should share a name with the home of the currant-filled pastry. 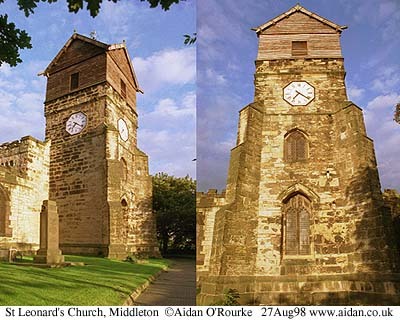 I suspect that in the past there was a church or some kind of religious community there, since the name 'Eccles' comes from the Greek word 'ekklesia' which originally meant a community or congregation, and is the root of words such as 'ecclesiastical'. That explanation occurred to me, but as far as I'm aware, there's no trace of a church or monastery on or around Eccles Pike, which is a barren, stony hilltop. Maybe there's a connection with the nearby town of Chapel, also named after a place of Christian worship. In you picture "Sunset over Strangeways and Salford" I live on the top floor of the tower block just visible in the haze in the top left of the picture. I have an absolutely fantastic view of the city centre from here and hope to send some photos soon. That would be great - I used to live on the 19th floor of Thorn Court, which overlooks Salford University. I'd love to run a webcam from a vewpoint like that - maybe some time soon. Subject: Possible new Idea for your Mancunian Site? Great Site, and a worthwhile one as well! I saw a message asking for ideas on what People would like to see on your site? Well, how about introducing a "Virtual Reality" part to your site of say Historical Buildings in Manchester, like Chetham's Library, free Trade Hall etc!? Not to do away with your excellent photo's, more as to compliment them? Also, can I just say how sorry I was to read one of your letter's from "Taline" in Stockholm, and of the bad time she seem's to have had in Salford? I was born in Lower Broughton some 51yrs back,and although I moved out to get married some 30yrs ago, I am still a Proud Salfordian! I know that the place was'nt always the "Poshest" --but one thing that any Salfordian was proud of was the "Warm Welcome" extended to Visitors etc! So Taline, from an "Old Boy" ---may I apologise for the obvious unhappy stay you had in Salford? I sincerley hope that one day the "Old Values" that were once endemic to both Salford and Manchester will again be practiced? I hope so too. Here's the place where Taline stayed during her year stay in these parts - It's the Castle Irwell student residence. The entrance to the former Manchester Races is on the right. Woodwards, a family business that found itself unable to compete with the modern chains especially in the area of competative pricing. Shopper loyalty kept them afloat for many years, and their 'Food Floor' was the primary source for imported British foods. Marks and Spencers came into the Canadian marketplace and found they too could not compete and I'm not absolutely certain, but I believe they closed down their Canadian operations completely. Another trafitional chain of stores that recently went under was Eatons which, like the Hudson Bay stores, now just called the Bay, they found it impossible to compete and Simpson Sears bought the rights to their name and have saved a few of the stores from extinction, the Bay was swallowed up into a group of companies. Woolworths left the scene, as did their successor Woolco. quality in some things I go elsewhere. really enjoyed working there and was quite good at my job even if I say so myself. With the store closed, what about the Arcade? I have a lot of memories about that short enclosed area and I'm not sure the subject is suitable for your site, but I'll talk about it nevertheless. The 'Ladies of the Night' used to congregate in the Arcade, plying their wares at all times of the day. As an apprentice, you've heard some of my tales of this time in my life before, my workmates and I used to frequent the Kardomah Cafe on Moseley St., just down from Lewis's, and this is where you would find these ladies on their 'Tea Break.' We got quite chummy with some of them, not professionally I should add, so much so that sometimes we would cruise the Arcade, see somebody new and compare service prices, then pass the info on to one of the girls we knew, then stepped back to watch the fireworks if a cut price service was on offer. Perhaps we had misheard it or something? Manchester Central Grammar School for Girls on Whitworth St. She usually wore her hair pulled back into a bun, a dark suit (pencil skirt, white shirt and a short jacket), but the heavy red lipstick and the pasty makeup would have been out of place in the school, but added a serious look that was quite out of character with the other girls. Sure enough, he arrived a few minutes later, still staggering and propositioned another working girl. It's a strange world. Well, that's about it for now, talk to you again soon. Fascinating - ladies of the night are seen as only a contemporary problem in Manchester. 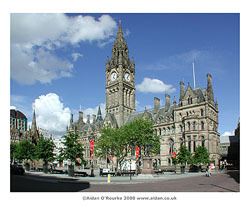 The Manchester Arcade and ladies therein is featured in the 1959 thriller "Hell Is A City". The Lewis's Arcade was turned into shop space a long time ago. Interesting to hear the Canadian perspective on trends in high street stores - consolidation and concentration seems to be a world wide tendency. 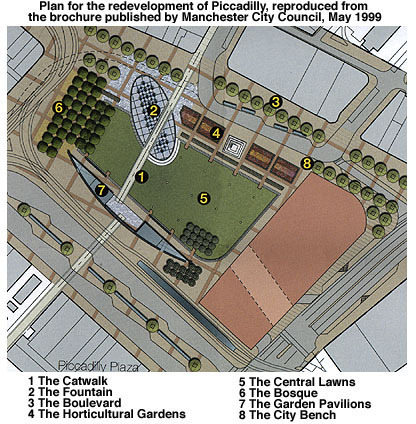 Just to add to the debate over the renewal of the space we all know as Piccadilly Gardens. If I remeber my history lessons from school correctly, this space was once occupied by a hospital wasn't it ? And before that,who knows ? The point I'm making is that all things change as time goes by, and although it's nice to turn a corner and see something like the 'old shambles', I can remember when they looked very different from the way they look now. They were also about three foot lower back in the 60's. I haven't lived in Manchester for 19 years,but growing up in Summer Street, Chorlton on Medlock (a street that has not existed for almost thirty years,but was once off of Upper Brook Street close to the junction with Hathersage Road), I can remember well the many changes that were going on in the 1960's. The tidal flow traffic system on Upper Brook Street, the Mancunian way being built, UMIST and many of the buildings that now form parts of the university. Progress, or call it change if you like, is a part of how we live. And although it's nice to dream of 'the good old days' I for one would not like to go back to living in a two up two down with an outside loo,and only one cold tap in the scullery. Whenever I visit Manchester, I'm always taken by the changes, but pleased to see how alive the city still is. The violence that is reflected in some of the letters to you, happens the world over, and was happening in Manchester long before we stopped giving our kids a kick up the bum for being naughty. I'm looking forward to seeing the new city when I next get back to see my dear old dad in Fallowfield.In the meantime I'll visit via the net. Some interesting thoughts - I know Upper Brook Street very well - along the street former areas of slum housing have been taken over by expanding hospitals and universities. Many examples of so-called progress turn out to be less than satisfactory. Tidal flow on Upper Brook St was intended to match road space with traffic demand - Five lanes with a bi-directional centre lane carrying traffic into the city in the morning and out of the city in the afternoon. Overhead lane markers designated which lanes to use. Unfortunately it proved impractical - too many head on collisions perhaps - and was discontinued. A tidal flow scheme still operates in Lincoln. Thanks for the great site. I often visit to see new and old photos of Manchester which I include in my webshots collection. I visit every few years and am always amazed at the changes occuring in and around the city. If you have any new or old photos of North Manchester, Prestwich,Whitefield or Bury I'd love to see them. Also if there is anybody who went to Cardinal Langley school in Middleton around 1970 who knows me e-mail me I'd love to hear from you. I've made a note of your location requests. Thank you for your comments. You're always welcome! Thanks for your comments. Present Location: Sacramento. California. U.S.A.
Move to the head of the class. I have no doubts that in time your name will rank among the famous. You have contributed in all classes, except sketching, so get cracking and you will outdo them all.What do other readers think? Write your support in readers messages. My best to all Mancunians, past and present. Thanks for your support. It's nice to get some recognition, at last! Thanks also for your support. By the way, Kieran is my old university buddy now resident in the US and originally from Belfast, a city with certain similarities to Manchester. 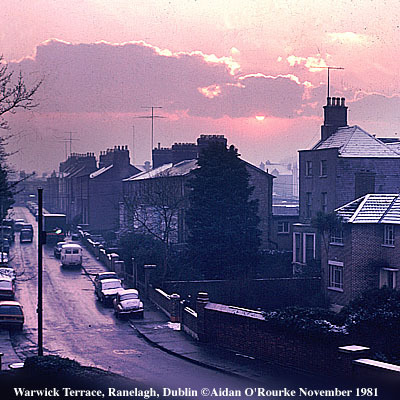 Here's the view from his room at 4 Warwick Terrace Rathmines, Dublin, as it appeared twenty years ago. I'm very new to all this computer stuff so please forgive any mistakes I'm making, I'll get better as time goes by (I hope). Anyway I just wanted to let you know that your web page is like a breath of fresh air to the many ex-pats that read it. In one of your photos (sunset over Strangeways) a reader wrote in about his earlier life in and around Salford. His claim to fame (as he put it) was that he once lived in the flats shown at the begining of Coronation Street, your reply was that you once lived in one of the flats in the wonderful photo. 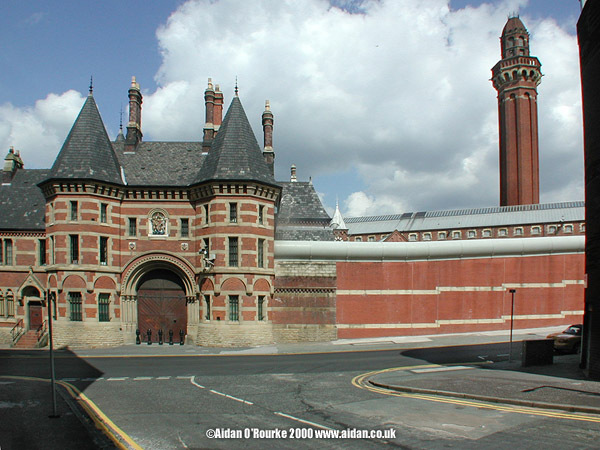 My claim to fame is I once live IN Strangeways. AGH!!! I hear you say, we've got a nutter on line.Well I like to think of myself as an Ex-nutter .Just a lad growing up in Chorlton-on-medlock and doing his best to hold his own. I never mugged old ladies (or anyone else for that matter), but I did like to fight in those days, and I was pretty good at it. So much so I ended up in the Manchester 'Queens Hotel' ,on my way to Hindley borstel. I tell you,having your 18th birthday in Strangways is a real wake up call and one I took full notice of. I actually worked at the Evening News as a copy boy one summer.That was in the days before computers, and my other claim to fame is that I made the front page back in 1959 (? ).Well a picture of me as a 4 year old with my mum and older sister .Some bright spark had hidden eight sticks of gelegnite in an armchair my mum bought. The army said it could have cleared half of Chorlton-on-Medlock. By all accounts it was in such a bad state they were ammazed it didn't blow. Anyway thats a little of my 'claims to fame' or should that read infamy? Oh well, I'm a long way from those days, both physically, mentally, and spititually. The whole website has got me hooked, I can now get back home without spending thousands of $'s to do it. Oh by the way, I was a City fan, yes ok, ok, enough said. I've always wondered what it's like to be behind bars. 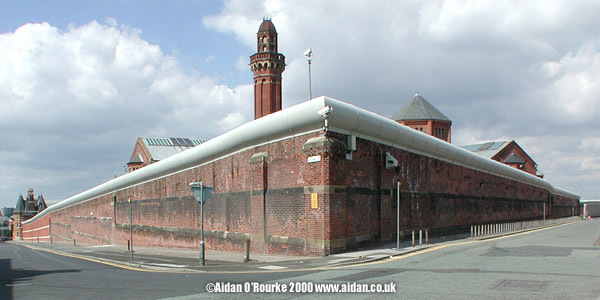 Watching 'Porridge' and driving under the bridge along the road which divieds the two parts of Strangeways prison, are the closest I ever intend to finding out, though if I'd lived in the Soviet Union or East Germany I might have been imprisoned for speaking my mind. 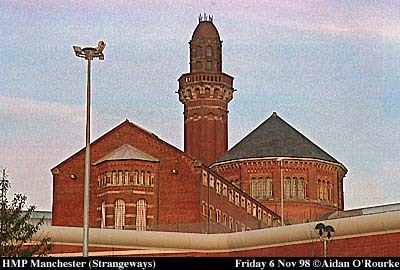 Strangeways, or HMP Manchester to use its official title, is very different now to how it was when you were a guest there. It has, I believe, much better facilities and is much more difficult to escape from. Thanks very much for your comments. Just got over 7 weeks of enforced sick leave following an operation. Now I'm back. I recall that the original "Coronation Street" used in the opening footage of the program was not called Coronation Street. I can't think of the name but I am sure that the "Street" was pulled down in the early '70s slum clearance of Salford. That's right - the street which inspired Tony Warren to create the drama was close to the former Manchester Docks and no longer exists. Just scanning through the messages when I came accross a comment by you about how lucky we are to have M&S etc etc (re Lewis's closing) Perhaps a slight irony publishing that on the day that 1/2 of M&S is closing! However I do agree with another article about building in the city with the Modern Look. Although i'm the first person to say that at the moment the town looks superb and everything is gleaming and new (and 'en vogue') However, when fashions change or it becomes a little more grubby, will it still look as good? Thirdly, just like to comment on something I saw on the news Re. 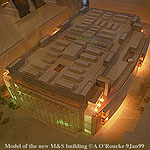 M&S, etc and how Selfridges are moving in and How Harvey Nicks are moving next door. Yes, I'd go along with that. As for Marks & Spencer sharing its store with Selfridges - The Exchange Square side will become Selfridges and the Market St side will remain M&S - let's look on the bright side, we still have half of M&S rather than losing all of it, and we're gaining Selfridges. You're right - there is a danger in creating too much of one type of amenity. In London in the eighties, an excess of office space led to a slump in the market, with very damaging consequences. Once again I have enjoyed your postings. Today's subject "Photography and Art" was of articular interest to me as I aspire to be the great artist that I know is inside me! I was also wondering if you could e-mail me with details of the Lowry book, so I could try to order it from here. I have several prints hanging at home to remind me of my roots. My Dad worked at Metrovick's (was that Metro-Vickers?) in Old Trafford so the factory scenes remind me of him. I also have fond memories of the victorian street in Salford Art Gallery (at that time, home to most of Lowry's paintings) We spent hours in that street, fascinated by the clutter, the lack of niceties, the 'primitive' yet romantic feel of the place. I would suspect that it's contents would be growing in value daily as part of the burgeoning antique frenzy and was wondering if it's still there and open to the public. Oh yes, Lark Hill Place is still one of the best features of Salford Museum and Art Gallery - The recreated street is a worthy attempt at capturing the Salford of old. For any book you can look on www.amazon.co.uk or bol.co.uk or contact me. Your comments on Manchester City Council are, in my opinion, unfair.Although you are correct in saying that on the whole Manchester is seen as a far bigger place than that covered by the City of Manchester, you cannot imply that the council does not have the right to make decisions on planning within its boundaries, it is democratically elected by the residents of Manchester, so it clearly does. As direct contributors to the City budget only residents of Manchester should have any say in the way our City is run. If you agree that Manchester covers a much larger area than just the City of Manchester, then you can't say it's elected by the residents of Manchester, because those living in Old Trafford, Droylsden, Middleton, Urmston, Denton and other places outside the boundary are excluded. Like the airport, Manchester city centre is of key regional importance, and planning decisions shouldn't be taken by just the City of Manchester local authority, but by a joint body. Due to voter apathy, only a tiny percentage of City of Manchester residents - almost down to single figures I believe - voted for the councillors who are currently taking decisions which will impact on the whole region. A recent attempt by the local authority to get people to express their opinions on local government, including an elected mayor, produced a pathetic response - only 0.06 per cent of City of Manchester residents bothered to participate. The organisation of local government, not so much the people involved in it, is the root of the problem. Councillors in the Town Hall, representing only part of Manchester, have the right to take momentous decisions affecting the whole of Manchester, and beyond. In the 80's a minority Conservative government had, under our present electoral system, the right to take unpopular decisions, such as privatising public transport, abolishing the metropolitan counties and introducing the Community Charge or 'poll tax'. Was it right for them to have that right? Join Aidan on his Manchester Photo Walk.